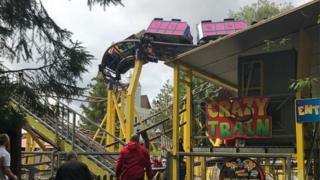 Twenty-one people, including several children, were rescued after a rollercoaster at the Gulliver’s World theme park became stuck. Fire crews used ladders and scaffolding to rescue the stranded passengers, which stopped 50ft (15m) in the air. Crews were called to the venue in Warrington, Cheshire, at about 13:10 BST and spent about two hours rescuing the passengers. Witnesses described seeing crying children on the ride. A mother described how it stalled while her seven-year-old daughter was on the rollercoaster. “Two wheels came off the ride and it stopped suddenly. “Kids were screaming and staff just stood there basically not knowing what to do for 20 minutes,” said the woman, who asked not to be named. “I’m just glad she’s safe but as a mother it was one of the most terrifying things I’ve ever seen. Firefighters used two ropes to lower three people to safety, and said everyone had been rescued by just after 15:30 BST. A Cheshire Fire & Rescue Service spokeswoman said no-one was injured in the incident. Gulliver’s World could not be reached for comment.